It’s impossible to resist these spicy chips. You can use floury or waxy potatoes – either will be good – but floury ones such as Maris Piper or King Edward will give you more crumbly, crispy bits. Preheat the oven to 200°C/Gas Mark 6. Give the potatoes a good scrub (you don’t need to peel them), then cut into thick chips. Put them into a saucepan and cover with cold water. Bring to a rolling boil and boil for 1 minute, then immediately drain well. Meanwhile, for the spice mix, crush the cumin, fennel, coriander and caraway seeds, if using, with the black peppercorns to a powder, using a pestle and mortar. Combine with the paprika, cayenne and salt. Pour the oil in a large, shallow roasting dish and put into the oven for 5 minutes to heat up. Set aside about 1 heaped teaspoon of the spice mix. Add the rest to the drained potatoes and toss together. Take the hot roasting dish from the oven, add the spiced potatoes and turn to coat in the oil. Roast for 35–45 minutes, giving a stir halfway through, until golden and crisp. Meanwhile, for the dip, stir the remaining spice mix into the yoghurt with the crushed garlic. Transfer to a serving bowl and sprinkle with a pinch of cayenne. 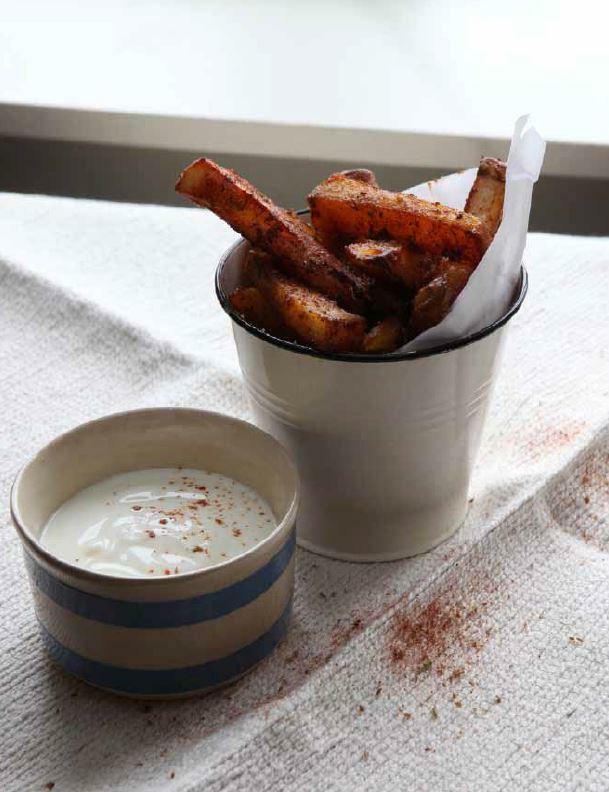 Test one of the spicy chips to see if they need sprinkling with a little more salt, then serve them hot, with the cool yoghurt dip.